What differentiates them from an average one? That’s the million-dollar question and the answer can actually bring you closer to generating a 7-figure income. Obviously, Michael Jordan, the G.O.A.T. and a successful entrepreneur, surely knows that greatness stems from believing in yourself (and in your product! ), but that’s not all there is. 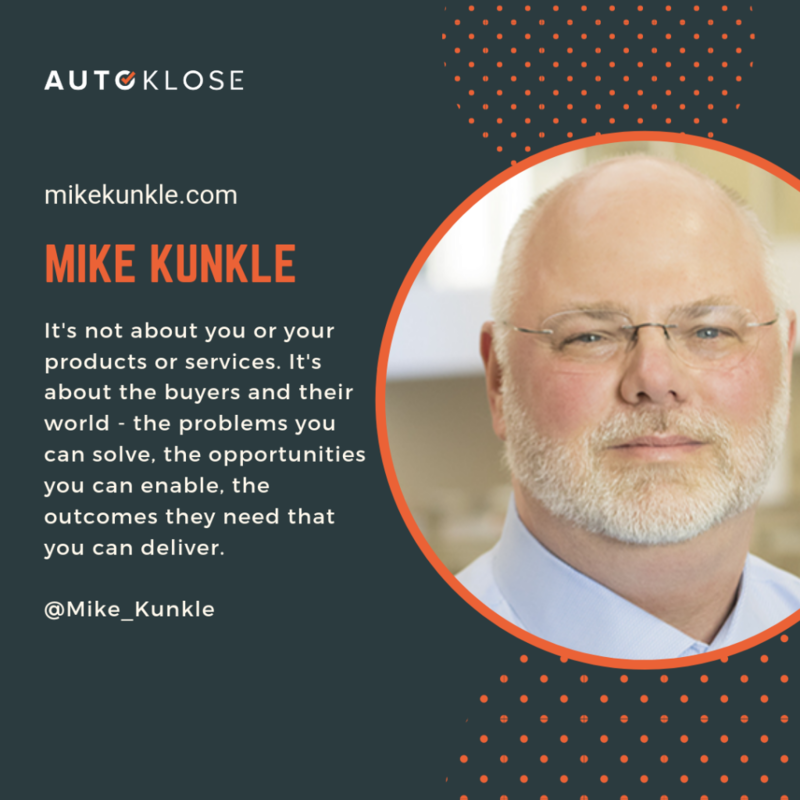 Shawn Finder, CEO of Autoklose, recently discussed this topic on his LinkedIn and provided a couple of interesting theories. The community’s response was amazing and a lot of sales experts contributed with their ideas. Let’s break down this topic into main points and see how to achieve greatness in your sales career and life. live by a code of ethics. But, it’s important to get to the bottom of things and identify the traits which explain in detail what great salespeople are made of. This is something you’ll never hear from a great salesperson. They own both their success and their failures. 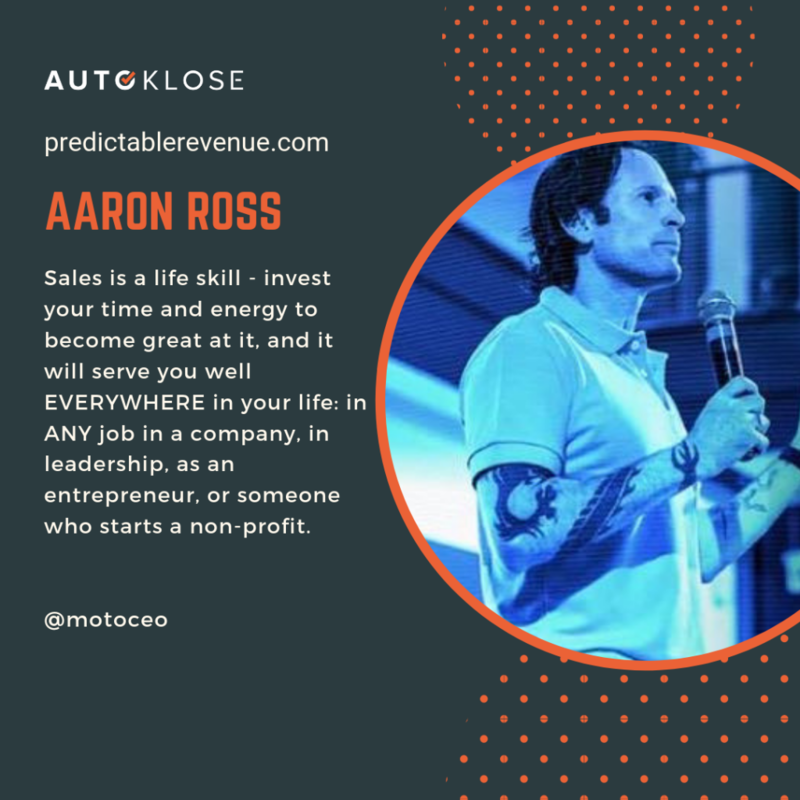 The grass is always greener on the other side of the fence, and many average salespeople believe that their successful colleagues have more luck or are in a better position. It’s pretty scary to think that you always depend on some intangible, mysterious forces which can ruin your deal. The trick is in doing your thing, working hard, and always pushing yourself to the limits. Don’t look for excuses when you come across a challenging task or a seemingly insurmountable obstacle. The right attitude is that you’re in control of your career and life. Average salespeople tend to blame bad circumstances, needy customers, or demanding bosses for their failures. And that’s the main reason behind their bad fortune. So, assuming control over your career and being responsible for your actions the first step towards achieving greatness. Taking responsibility and being a leader requires a great deal of expertise in your field. That’s why great salespeople are experts, not just in sales, but also in psychology and communication. The more you know about the industry, your product, as well as your competitors and their products, the more confident you’ll be. And your prospects can feel when you’re knowledgeable and confident. When you want to buy a car, you expect that sales rep can tell you all the benefits of the car and not just list the specs that you can read yourself. You want to know why that model is better than the other one, and what its good and bad sides are. You need to trust that person and believe what they say is based on their knowledge and experience. Great salespeople know a lot, but they never stop learning new skills and improving themselves. They’re curious, motivated, and driven. Salespeople who base their demos and presentations on talking like a broken record are the ones who gave this profession a bad name. Selling isn’t about talking your prospects’ ears off. It’s about asking the right questions. That way you put your prospect and their needs first and get to hear and learn important things about them. This process leads to a greater and deeper understanding of your prospects and their needs which is crucial for solving their problems. Great salespeople don’t give up. 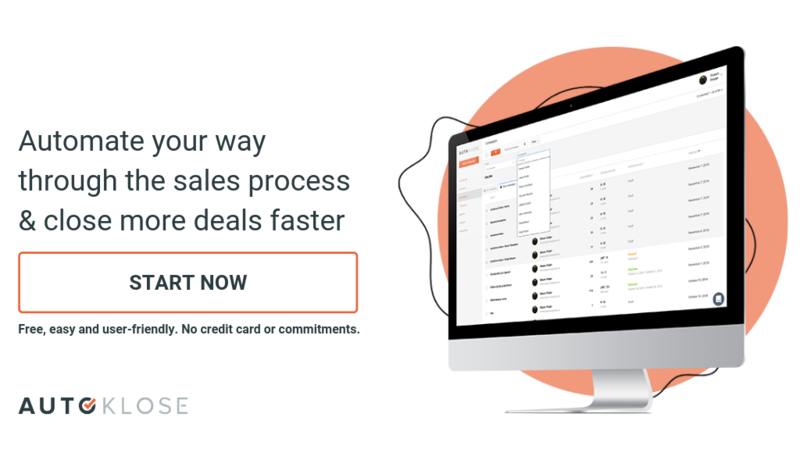 The sales cycle in the B2B industry is longer than in the B2C, and there are fewer impulse purchases. The reason for that is that products and services are more complex, which means that you need to educate your prospects and explain how exactly they can benefit from your product or service. Still, average salespeople usually quit after just one follow up, while it takes somewhere between 5 and 15 follow-ups to get your prospects to respond or to make an appointment with them. So, plan your outreach carefully and create an effective sales cadence. Since it can be hard to follow up persistently and successfully without coming off as a nuisance, we came up with a blog post which will help you navigate uncharted waters of following up. Being a great salesperson isn’t about selling. It’s about helping others solve their problems. When you’re truly invested and when you genuinely care about your prospects, your focal point isn’t how to get them to make a purchase but to find the best solution for them. And this approach will result in generating sales. So, change your point of view and don’t start a meeting or demo focused on how to sell something. Making a sale shouldn’t be the first thing on your mind – your prospects’ pain points and how to relieve them should. The LinkedIn community provided tons of useful tips& tricks on how to transform yourself into a great salesperson. And that’s exactly what Juan Alfonzo says. This is on point, as we all know the importance of understanding our prospects and being able to “put yourself in your prospects’ shoes,” as Willie Hayden says. “No” is the scariest word in any language. 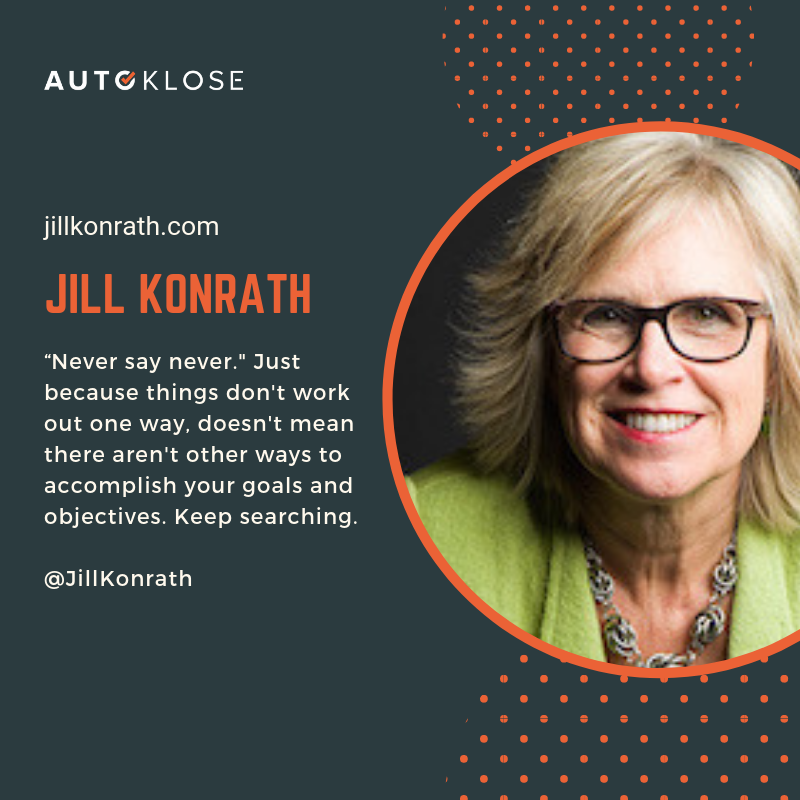 Don’t give up after that dreaded “No” and use the knowledge and the information you obtain through this process in order to improve your next attempt and close a deal. “Great sales professionals always find a way to win. They don’t give in to negativity or create excuses as to why a deal wasn’t made. The mindset of always wanting to improve will enable a sales professional to give everything they have during the sales process. If a deal isn’t made, they keep going but find the time in understanding what went wrong. Being in a sales situation with someone allows you to know at that moment, they want or need something. It’s up to you in making sure you present that. 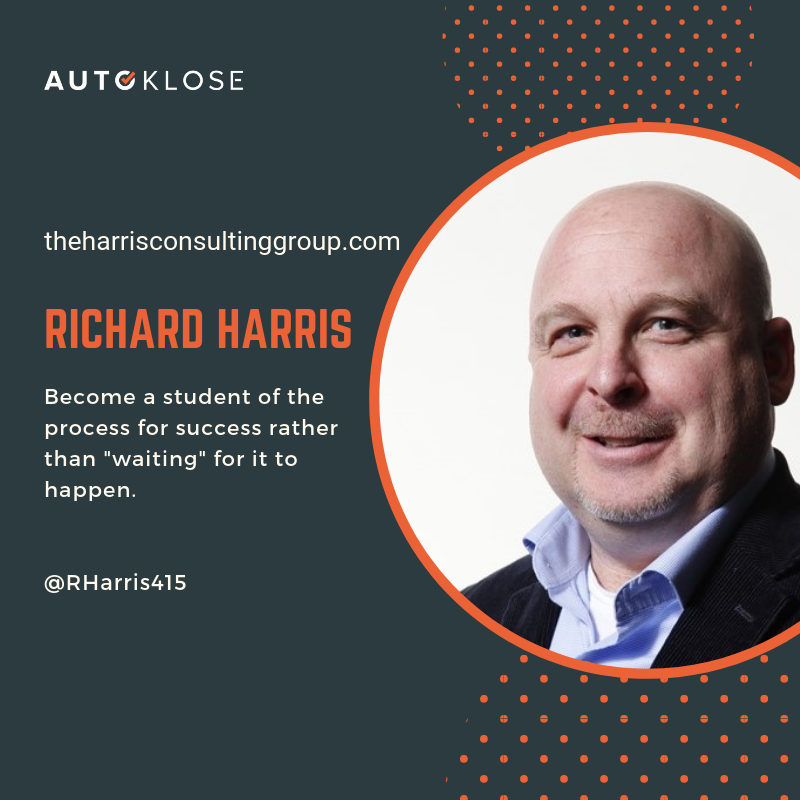 A great sales professional will put in the work in making sure they acquire that skill set,” is Christopher Randone’s take on the topic. So, always take time to learn a new skill. 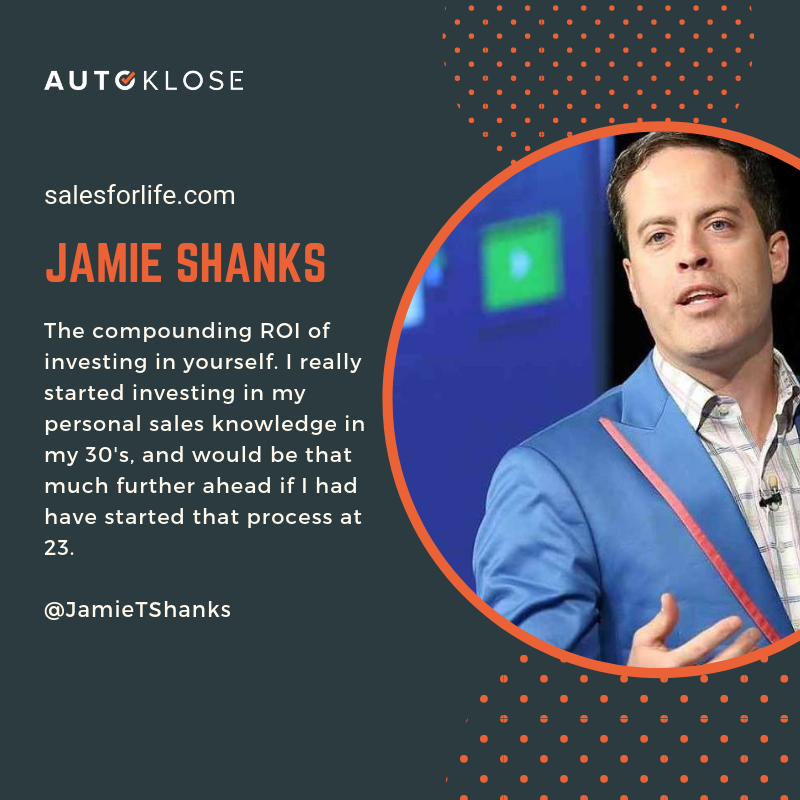 Read a book on sales, listen to sales podcasts, and attend webinars (subscribe here), such as the ones that Shawn Finder hosts on a regular basis. “Great salespeople ask rich questions and listen carefully. Each question builds insight and trust. Those that are trustworthy are successful,” says Chris Devlin, while Elysa Zeitz seconds that. The skill of active listening something that sets great salespeople apart from the average ones. Successful communication is a two-way street, so make sure that you not only listen but HEAR your prospects and their message. This is a particularly important notion because average salespeople believe that they need to talk all the time and that silence is something awkward that should be avoided at all costs. This is a make-it-or-break-it factor for every successful sale. 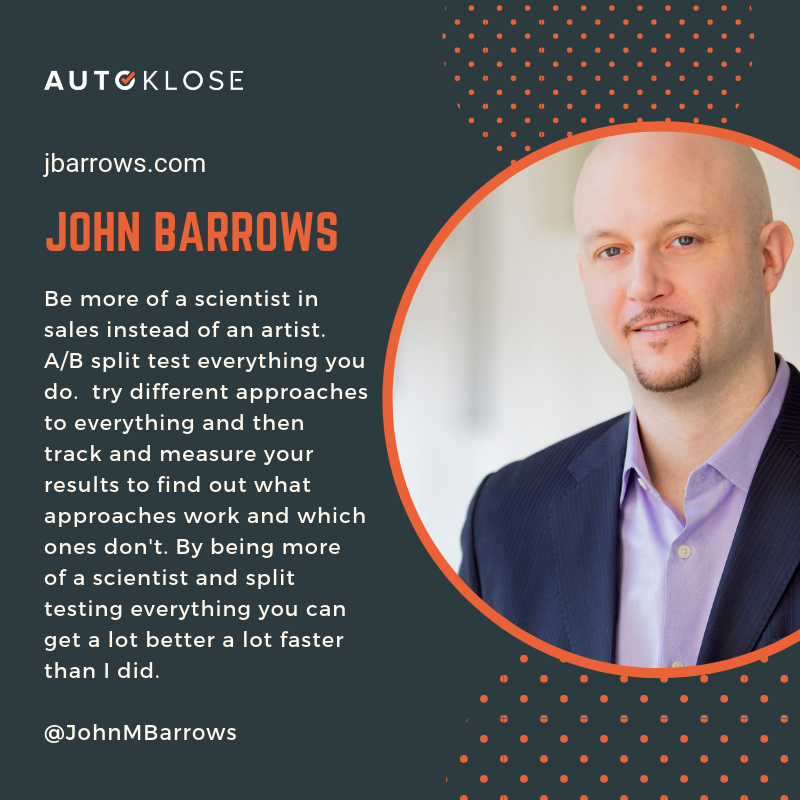 Instead of trying to talk your prospects into buying whatever you sell, take your time to get to know them and connect with them on a deeper level. 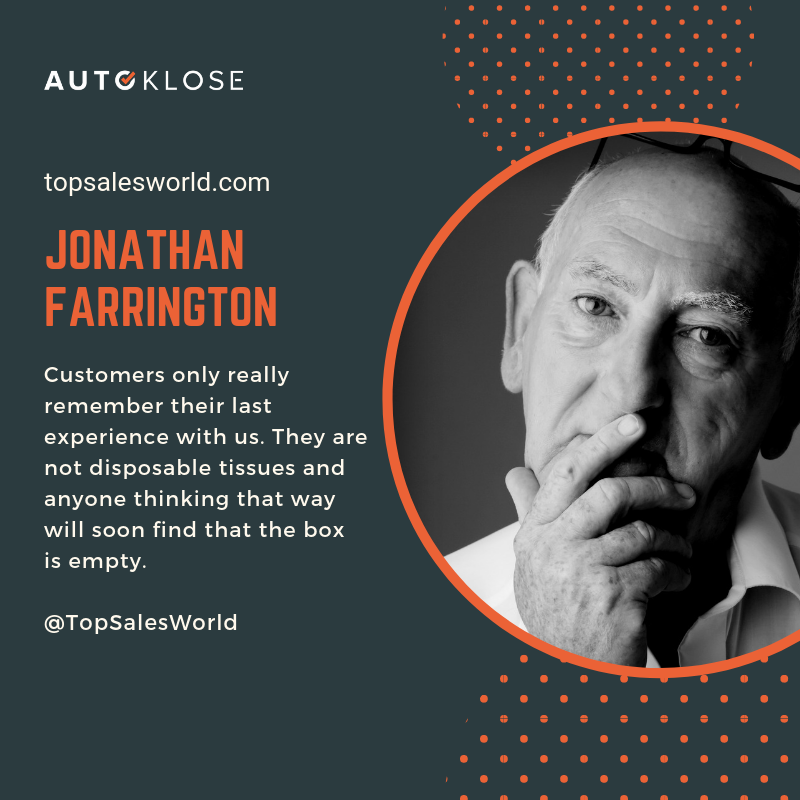 “Great salespeople don’t “sell”, they do whatever it takes to make it easy for you to buy (exactly what you need),” is what James King thinks. This relationship-building skill is what’s going to land you tons of new sales and deals. “It starts with integrity and passion,” says Willie Hayden. Only a driven salesperson who relentlessly tries to do their best in order to make their prospects and customers happy can become great. Great salespeople don’t count minutes until it’s time to go home. They grind every day, even when everybody else leaves. They enjoy helping others succeed, and that’s the secret of their success. 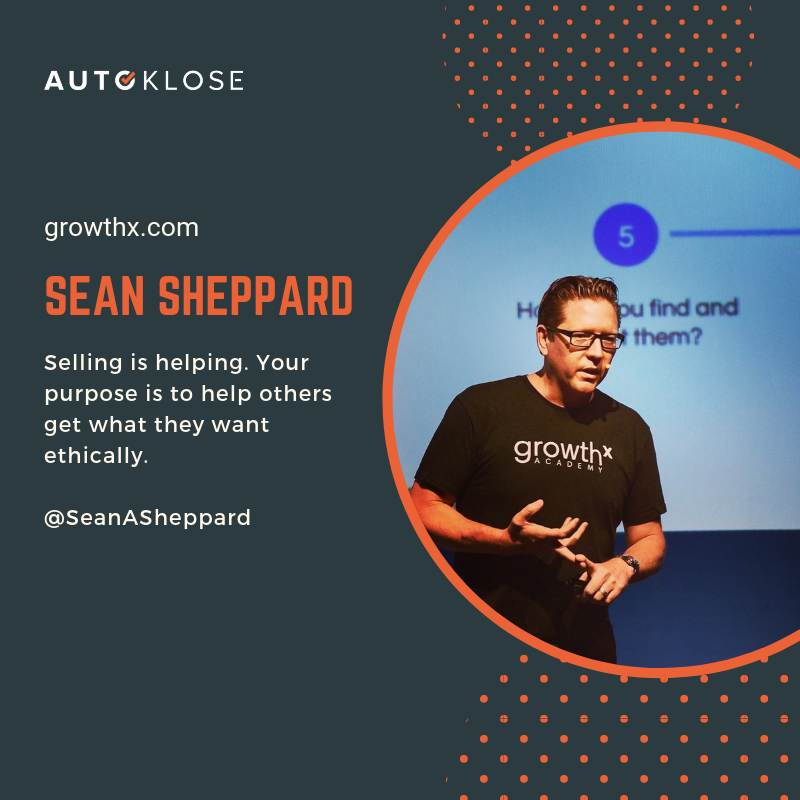 Although this might sound like an oxymoron in terms of the whole “great salespeople make connections not sales, we still have to say that great salespeople “Spend their time selling! Top salespeople spend 36 percent more time selling than the rest. They focus their time on the activities that directly generate revenue,” as Keith J. points. In other words, unlike average salespeople, the successful ones actually love the very idea of selling. They’re pumped and approach this whole process as a challenge and not as something that you do because you’re between jobs and have to make a living. 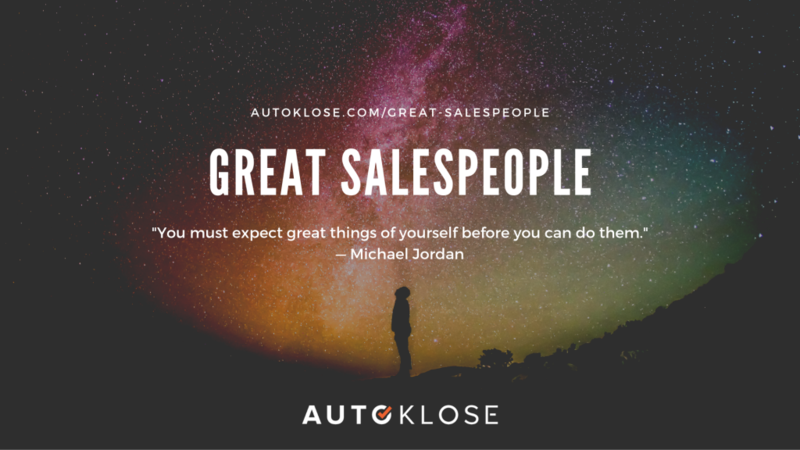 Finally, “Great salespeople like people. Simple as that,” concludes Brian Abut. As we have already said, this is something that can make a difference when it comes to closing a deal. But it doesn’t take just a follow-up for the sake of it. What you need to do is craft “Intelligent follow-up that includes additional information about the project or communication to educate the customer,” says Mike Albert [LION 1000+]. 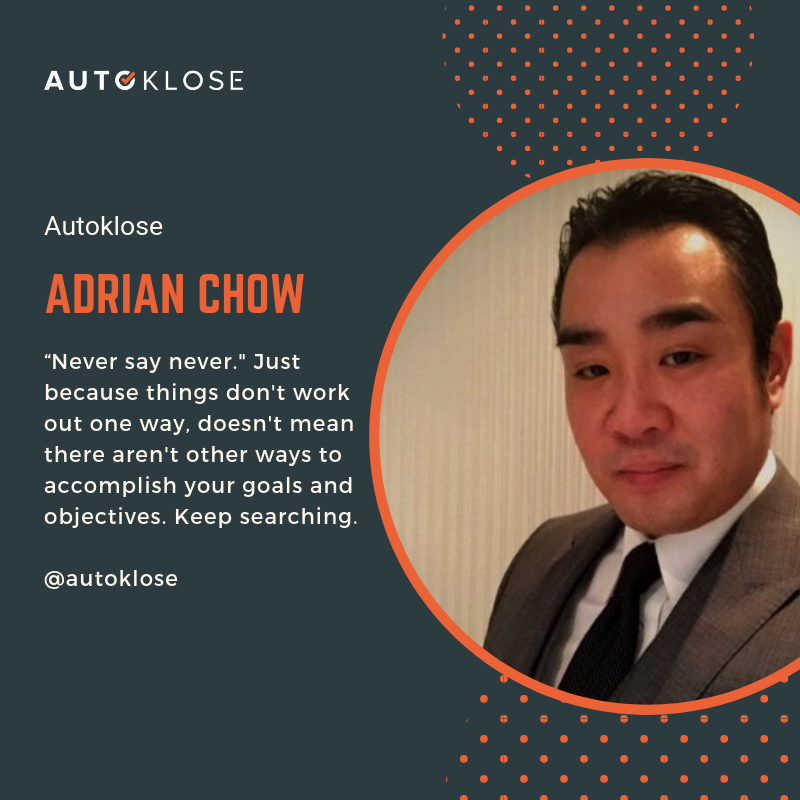 Sometimes it can be tough to do it properly, which is why we built Autoklose, a sales automation platform which will, among other things, help you create, schedule in advance, and launch your campaigns and follow-ups. You don’t have to think whether you replied to that prospect from the other day, or whether you already sent the second follow-up email to those who didn’t respond. Rocco Fiore came up with this one, and we have to agree with him completely. 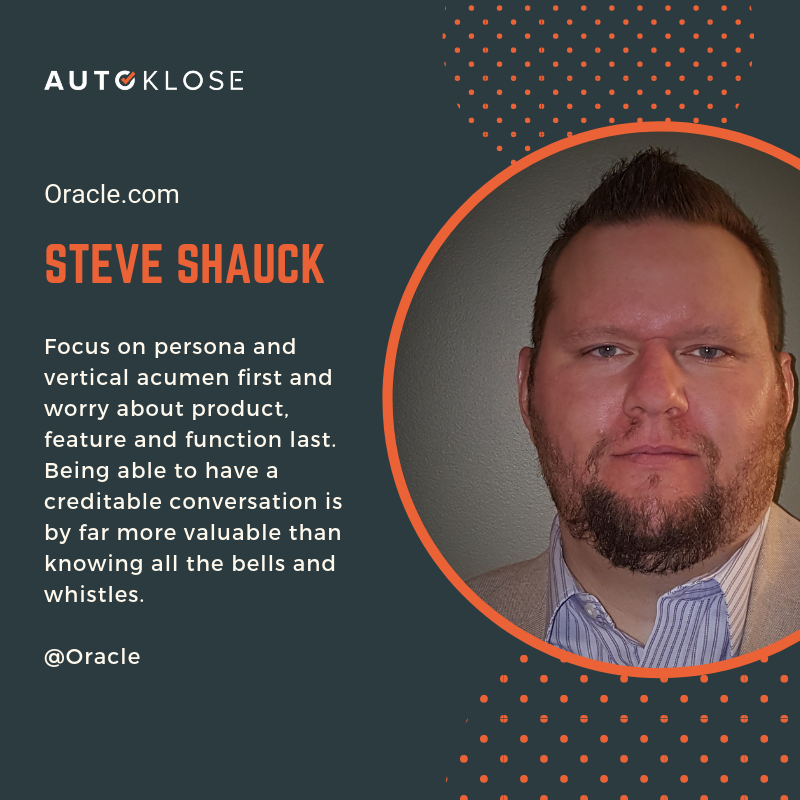 Great salespeople are always impeccably organized, according to Shane Oren, and their daily routine runs like clockwork. In addition to that, it’s important to “Strategize every move in the sales cycle,” advises Jon Feldman. Knowing where you’re headed and what your next move should be is a must. So, if you want to achieve excellence, make sure to insist on the order. This includes that you have to keep your promises and attend the meetings you organized or were invited do. To cut the long story short, if you want to be a great salesperson, “Master showing up!” just as Patrick Boyle suggests. “Great salespeople understand & own that if they don’t show enough differentiating value R.O.I.-wise and the capacity to move the clients business objectives forward, that in turn, they accept they don’t deserve the given opportunity. Period. They own. Yet, the great ones also know that part of the differentiating process is presenting in compelling fashion the value THEY personally bring & the value their COMPANY brings – and have testimonials to back it up. Key to referrals as well. So, go out of your way to add value to your prospect and show that your primary goal is to help them. This interesting quote from Sonya Meloff hits the bull’s-eye. Instead of wasting their time talking with people who don’t have decision-making authority, they reach out to those who have the power to say yes or no. When it comes to reaching top decision-makers, it can be a challenging task, which is why we discussed some of the methods that work. This is a true gold mine of information on how to become a great salesperson. Let us know what your thoughts and experiences are.